At each visit you will expect a thorough investigation of your mouth, including a soft tissue screen for oral cancer. The teeth and gums are assessed for health, and relevant tests may need to be taken to ensure a healthy mouth. These may include digital x-rays, scans or models. 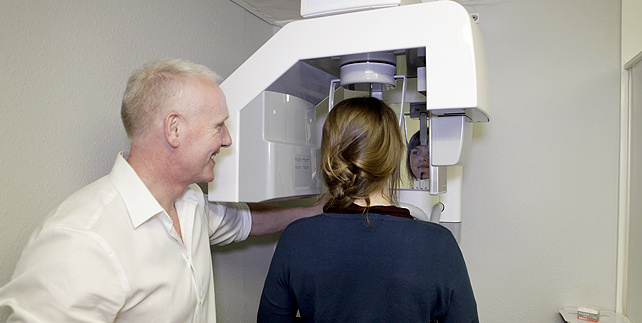 We can use our intra-oral cameras to show you any areas which could benefit from discussion and to help in the education of your teeth and gums. An Intra-oral (small x-ray): an image is taken using a small film placed inside your mouth. The digital image helps the dentist diagnose pathology such as tooth decay, gum disease or any other anomaly. We use the latest up to date equipment to ensure that you receive the very lowest, minimal exposure possible. Your safety is very important to us. A Panoramic x-ray is a two-dimensional image that captures the entire mouth in a single image, including the teeth, upper and lower jaws, and surrounding structures and tissues. It is commonly performed by dentists and oral surgeons in everyday practice and is an important diagnostic tool to plan treatment for periodontal (gum)disease, full and partial dentures, extractions and implants.